The "1950s" town square is built in a warehouse in Chula Vista, California, and features an old-school gas station.Courtesy George G. Glenner Alzheimer's Family Centers, Inc. The world can be a confusing, frightening place for people with dementia. Now, a new kind of innovative adult day care could help soothe their minds — and stimulate their brains — with a trip back in time. The country's first “dementia town square," a simulated village made to look like it’s from the 1950s, opens to the public later this month and NBC special anchor Maria Shriver got an exclusive first look. “Independent research really shows that people make their strongest memories between about the ages of 10 to 30. And if you can take people back to a time when they literally have the ability to be surrounded by prompts from their past, that's shown to reduce agitation, improve mood and improve sleep quality,” said Scott Tarde, CEO of George G. Glenner Alzheimer’s Family Centers, which runs dementia daycares in the San Diego, California, area. 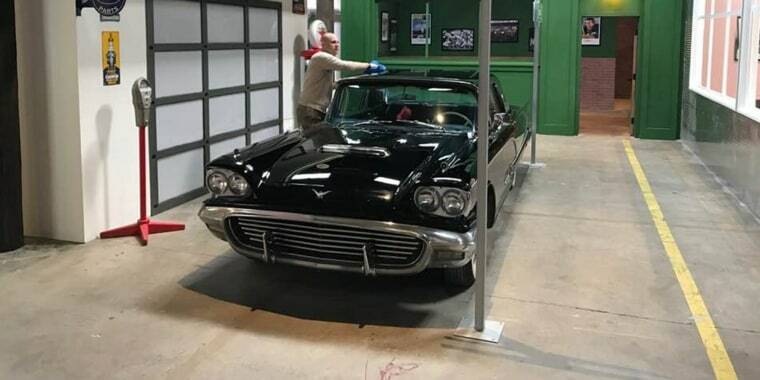 The company built the new facility in a warehouse in Chula Vista, where trained aides guide small groups of dementia patients through 14 activity centers set up as storefronts — everything from a vintage clothing store, where they can try on clothes, to an old-school gas station, where they can sit inside a '50s Thunderbird. There's a full-service diner and a movie theater playing classic films — all designed to replace the monotony of regular daycare and ignite patients' brains with memories of their youth. Everything is designed to trigger their minds. This retro diner is part of a daycare for dementia patients that looks like a town from the 1950s. The familiar images from their youth are designed to stimulate their memories.Courtesy George G. Glenner Alzheimer's Family Centers, Inc. The approach is called reminiscence therapy, though organizers are careful to not try to fool patients into thinking it's now actually the 1950s. “These are things that promote socialization, promote activities, promote really engagement at a level where their memories are their strongest, as opposed to trying to keep them in a time when their memories are not as clear to them, and that may create anxiety, that may create more confusion,” Tarde said. Shriver was there when dementia patients Elberta Reed and Tola Romero received their first guided tour of the square. Accompanied by family members, they lit up at the sights and danced to their favorite sounds. Their families said the innovative new approach is a blessing for their loved ones and themselves. “A big thing is they're like, ‘I'm lonely’ you know at home. She doesn’t really talk with us during the day, but being out and about with other people, she communicates more,” said Dona Reed, Elberta’s daughter-in-law. “I can drop her off here and know she's in very good hands, and I can go take a deep breath somewhere. She has to have somebody with her 24-7. So just those few hours make a world of difference in my mental state,” added Mercy Romero, Tola’s daughter. This is not the first innovative care facility for dementia. In 2016, an Ohio-based assisted living center catering to patients with dementia received attention for its resort-like design. In 2009, a dementia-friendly village was created in the Netherlands where patients actually live. Tarde said he's focused on day care for now, hoping to spread his town square concept to 200 locations nationwide. A visit costs $95 for eight hours of specialized care, filled with music, laughter and long walks down memory lane. It’s soothing for patients and their caregivers. “In the '50s, that's when she was raising her family and she was having a good time. And I think hopefully that's going take her back there and she'll be happier,” Mercy Romero said. The town square program groups patients by their level of dementia to better tailor activities to their needs. Day cares like this usually aren't covered by insurance, so if you have loved ones with dementia, experts say you can practice reminiscence therapy at home: Play their favorite old songs, look at old family photos, watch movies from their youth and then talk about their memories.